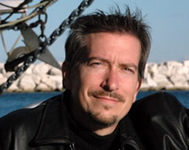 Bradley P. Beaulieu is a winner of the L. Ron Hubbard Writers of the Future Award. 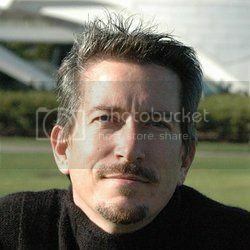 His stories have appeared in Realms of Fantasy, Orson Scott Card’s Intergalactic Medicine Show, Writers of the Future 20, and several anthologies from DAW. Mr. Beaulieu is a software engineer and an amateur cook. He loves to cook spicy dishes, particularly Mexican and southwestern. He lives in Racine, Wisconsin with his wife and children. Learn more about him at Bradley P. Beaulieu‘s website. Today, Bill and Jana chat with Bradley P. Beaulieu, whose most recent novel — Twelve Kings in Sharakhai, from DAW Books — is a richly detailed epic fantasy set in a bustling desert city. We discuss story structure, the difficulties in thinking outside genre molds, and literary influences. One lucky commenter will win their choice of a book from our stacks or a Fantasy Literature t-shirt! Bill Capossere: Can you talk about your decisions regarding structure — the use of flashbacks, the ordering of them, etc. Did you start with this structure in mind or is it one you worked your way through? Did you have a specific goal in mind with the structure beyond just not using the same old same old linear structure? 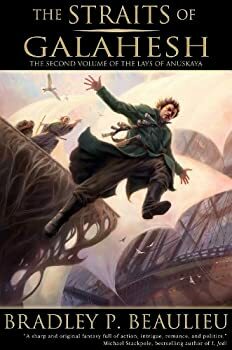 When I picked up Bradley Beaulieu’s The Straits of Galahesh, the second book in his THE LAYS OF ANUSKAYA series, it had been a while since I’d read the first book, The Winds of Khalakovo, so I was worried that I had forgotten many of the story details. But Beaulieu, in his infinite wisdom, put a summary of the first book where a prologue would be. Not only did this refresh my forgetful brain, but it kept Beaulieu from having to drop in constant “reminders” throughout the book. There were no refresher paragraphs sprinkled throughout the prose, which was absolutely wonderful. If you just came from reading The Winds of Khalakovo, you could skip that section. If it’s been a while, reading the first section will bring you up to speed and help you remember everything you might have forgotten. The Song of the Shattered Sands — (2015- ) Sharakhai, the great city of the desert, center of commerce and culture, has been ruled from time immemorial by twelve kings — cruel, ruthless, powerful, and immortal. With their army of Silver Spears, their elite ompany of Blade Maidens and their holy defenders, the terrifying asirim, the Kings uphold their positions as undisputed, invincible lords of the desert. There is no hope of freedom for any under their rule. Or so it seems, until Çeda, a brave young woman from the west end slums, defies the Kings’ laws by going outside on the holy night of Beht Zha’ir. What she learns that night sets her on a path that winds through both the terrible truths of the Kings’ mysterious history and the hidden riddles of her own heritage. Together, these secrets could finally break the iron grip of the Kings’ power…if the nigh-omnipotent Kings don’t find her first. 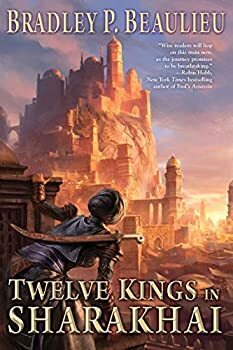 Twelve Kings in Sharakhai is the first book in a new series by Bradley P. Beaulieu set in the great desert city of Sharakhai, ruled for centuries by the same dozen Kings who long ago made a pact with the gods to fend off the desert tribes and establish their power. As a novel that comes to its own semi-resolution, it's nicely rewarding in its own self-contained way (if not without some issues), but Twelve Kings in Sharakhai, I’d say, works even better as an evocative opening to a world whose full complexity is only just hinted at by the end. 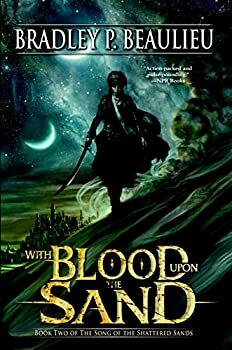 With Blood Upon the Sand (2017) is the second in Bradley P. Beaulieu’s THE SONG OF THE SHATTERED SANDS series, following up on the excellent Twelve Kings in Sharakhai. The sequel didn’t grab me quite as fully as its predecessor, but it’s quite nearly as good and certainly has me eager to continue reading the series. 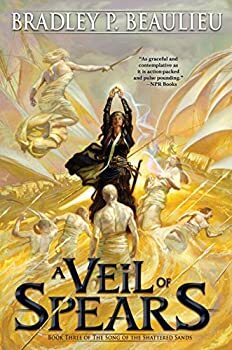 Bradley P. Beaulieu returns to his desert setting in A Veil of Spears (2018), the third novel of THE SONG OF THE SHATTERED LANDS series. Book one for me remains the strongest, but both the sequel and now A Veil of Spears are worthy follow ups that both deepen and broaden the story and the characters. I’m going to assume you’ve read the first two novels (you really need to have done so), so fair warning that there will be spoilers for those two books ahead. Strata — (2011) Publisher: Strata is a stand-alone novella by two Writers of the Future Award winners. It’s the middle of the twenty-second century. Earth’s oil and gas reserves have been spent, but humankind’s thirst for energy remains unquenched. Vast solar mining platforms circle the upper atmosphere of the sun, drawing power lines up from the stellar interior and tight-beaming the energy back to Earth. For most of the platforms’ teeming masses, life is hard, cramped — and hot. Most dream of a return Earthside, but a two-way ticket wasn’t part of the benefits package, and a Sun-Earth trip doesn’t come cheap. Kawe Ndechi is luckier than most. He’s a gifted rider — a skimmer pilot who races the surface of the sun’s convection zone — and he needs only two more wins before he lands a ticket home. The only trouble is, Kawe’s spent most of his life on the platforms. He’s seen the misery, and he’s not sure he’s the only one who deserves a chance at returning home. That makes Smith Pouslon nervous. Smith once raced the tunnels of fire himself, but now he’s a handler, and his rider, Kawe, is proving anything but easy to handle. Kawe’s slipping deeper and deeper into the Movement, but Smith knows that’s a fool’s game. His own foray into the Movement cost him his racing career — and nearly his life — and he doesn’t want Kawe to throw everything away for a revolt that will never succeed. One sun. Two men. The fate of a million souls. Lest Our Passage Be Forgotten & Other Stories — (2013) Publisher: With The Winds of Khalakovo, Bradley P. Beaulieu established himself as a talented new voice in epic fantasy. In his premiere short story collection, Beaulieu demonstrates his ability to weave tales that explore other worlds in ways that are at once bold, imaginative, and touching. 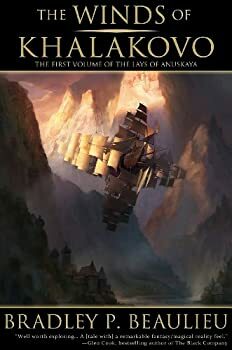 Lest Our Passage Be Forgotten & Other Stories collects seventeen stories that range from the epic to the heroic, some in print for the first time, including two new stories set in the world of The Lays of Anuskaya. CLICK HERE FOR MORE BY BRADLEY P. BEAULIEU.